This botanically-rich vitamin E Cream naturally delivers deep, long-lasting moisturisation and effectively helps minimise the visible signs of skin ageing. 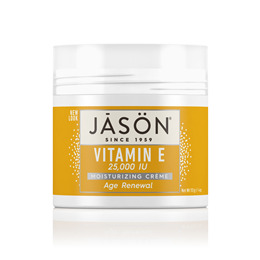 Rejuvenating vitamin E replenishes lost moisture. Natural avocado oil, high in essential fatty acids, helps restore elasticity and resilience. Aqua (Water), Tocopheryl Acetate, Glycerin, Cetyl Alcohol, Stearic Acid, Caprylic/Capric Triglyceride, Dimethicone, Glyceryl Stearate SE, Helianthus Annuus (Sunflower) Seed Oil*, Persea Gratissima (Avocado) Oil, Citrus Grandis (Grapefruit) Fruit Extract, Ascorbic Acid, Carbomer, Potassium Cetyl Phosphate, Potassium Hydroxide, Sorbic Acid, Benzyl Alcohol, Phenoxyethanol, Potassium Sorbate, Sodium Benzoate. *Certified Organic Ingredient. 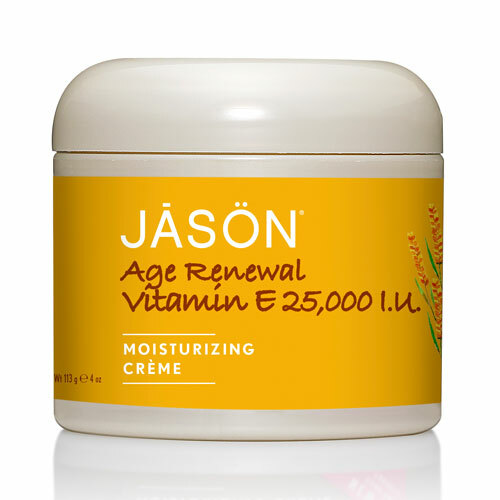 Below are reviews of Jason Age Renewal Vitamin E 25000IU Cream - 113g by bodykind customers. If you have tried this product we'd love to hear what you think so please leave a review. This botanically-rich Vitamin E Cream naturally delivers deep, long-lasting moisturisation and effectively helps minimise the visible signs of skin ageing.